This pro debossed folder has so many conveniences for busy professionals. Made with UltraHide simulated leather, this padfolio has the look and soft feel of rich nappa leather. Sleek turned-edge construction keeps it looking nice longer. Technology-friendly interior organizer features two pockets for PDA, iPod or cell phone; slip-in flaps keep electronics safely contained, and items can be stored behind the smaller pocket. Includes interior gusseted file pocket, two smaller pockets and wide-body pen holder (pen not included). Also has a built-in, full-function calculator with a pocket behind it; solar-powered calculator also includes one replaceable button-cell battery. 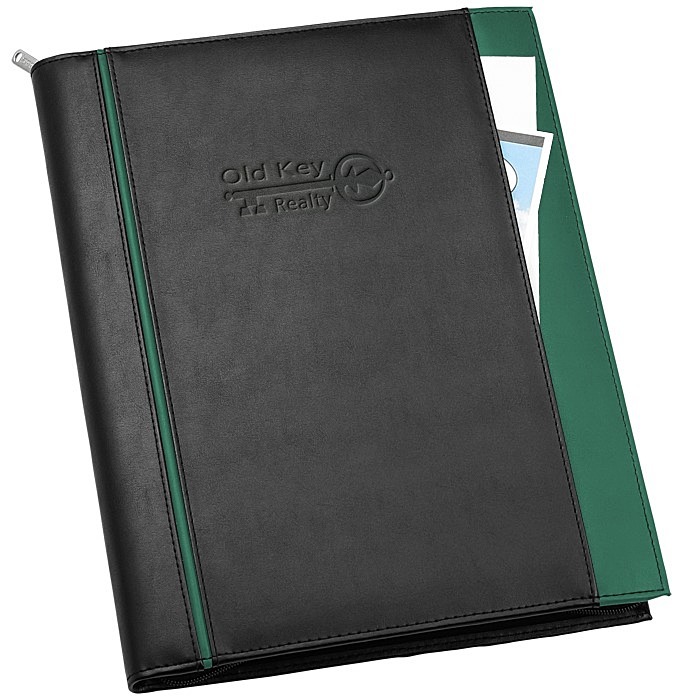 Contains a lined, ruled writing pad (11" x 8-1/2") with matching privacy cover and 25 sheets; other contents not included. Zippered closure secures your important documents and papers; zipper pull is brushed silver. Sleek exterior pocket allows quick access to necessary documents. Folder is black with your choice of trim color. Size: 13-1/2" x 11" x 1-1/4"
Your price includes a debossed imprint centered on the upper front cover. Set-up charge: add $50 per location.